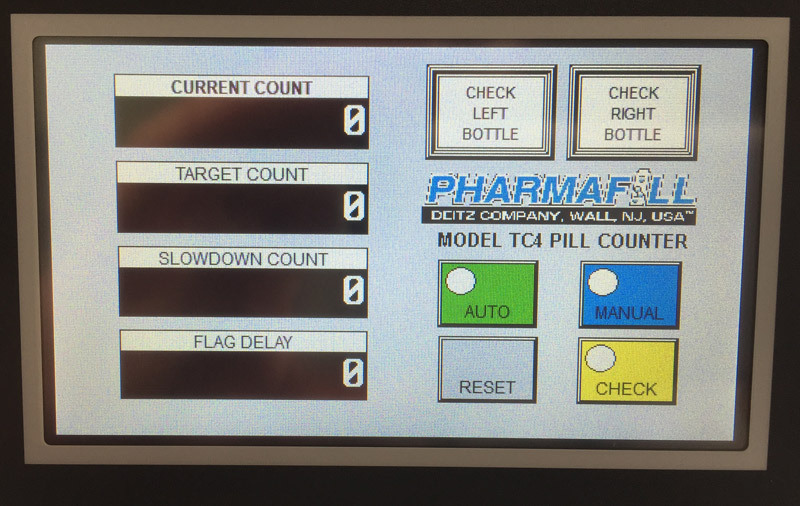 Wall, NJ: The Pharmafill(TM) TC4 tabletop pill counter from packaging machinery manufacturer Deitz Co., Wall, NJ (www.Deitzco.com), now features the company’s new human machine interface (HMI) as standard at no extra charge. Developed to provide a state-of-the-art control panel that is intuitively easy for entry level workers to use, the new HMI replaces the classic membrane switch panel with a full-color, touch-screen display that presents all the data needed for setup and operation on a single screen. With simplified data entry, the HMI speeds the bottle filling process and reduces the potential for human error. Ideal for nutraceutical, cosmeceutical and contract packaging companies, the TC4 pill counter with the new HMI automatically counts tablets, capsules, softgels, caplets, lozenges and other solid oral dose products at up to 2,000 per minute with 99.95% accuracy, whether the products are transparent, translucent or opaque. Devised as a low-cost entry into automation from manual counting and filling, the electronic tablet counter integrates computer-controlled operation and the company’s proprietary counting sensor with manual bottle placement and removal. The portable, tabletop design measures 34 inches across x 21 inches deep x 30 inches in height for easy placement in the production line as space permits.